A somewhat unusual man unexpectedly entered my life in 2002. One of the first things we did was to take an organized look at the state of sound technology development, in part triggered by an exercise we did called “25 Intuited Ideas for a Changing World.” We felt it was a very appropriate beginning point for turning pure intuited business information into a productive and profitable new business. Sure enough, after some focused research on trends in existing larger companies, very promising opportunities seemed to be at hand in the area of nanotechnology and sound. After 60 to 80 hours of intuitive questions and answers about sound from the macro to the micro, we felt we were poised to make a difference. We could be guinea pigs in embedding intuition in an open way at every level of an organization. Another colleague and sound expert from New York also helped us in the early stages, as well as Kip’s life partner Sue Phillips. We imagined that we would become the company to design tools which would help scientists make future generations of tools. In this way, scientists would be able to delve even deeper into the wondrous workings of nature. We also preliminarily designed an entertainment product to introduce our new sound technology (should we achieve it) to a broad public market. Kip became ill and died about 18 months after we began this project, so we never found out how far we could go. What follows, however, are tips we learned at the very earliest stages of this little experiment about the use of intuition in the development of a new product, service, and organization. • Start with intuition: begin with a sudden spurt of inspiration, a waking dream, a feeling, an image, a trigger in your environment that makes you fly. The very first event was an inspired thought or hunch that seemed to come from nowhere. I had been reading an August 2002 Business Week article on “25 Ideas for a Changing World” with interest, and mentioned it to colleagues in our regular meetings. Suddenly the thought hit: “Why don’t we propose 25 intuited ideas for a changing world?” I no longer remember whether the thought came from me, from a colleague, or from a moment of musing, but it was that simple question that began what eventually became a source of impassioned inquiry, even leading to the formation of a company to design a multi-sensory product made of various specific materials. Chris: …outline what new businesses will have to think about. Helen: The first thing has to do with hearing, because it is an apt metaphor for all that is occurring in the world at this time. Innovation in sound will affect every technology currently utilized anywhere. Helen: Very shortly intention will be measurable by sound, by frequency. Just as people use EEG’s, EKG’s, and all of these other medical devices; lie detectors to measure truth or lies…sound in its subtleties will provide a deeper knowing of humanity than any other sense that has been explored to date. This will mean that music will change, listening and recording devices will change. There will be abuses of this knowledge, as well as enhancements. Marketing will become sound focused. Advertising will become sound focused. Healing will become sound focused. And instrumentation for alignment for the physical body, and perhaps for organizations not too long afterwards, will be sound focused. This is muzak taken to a very different level. [end of excerpt]. • Using the intuited information, begin to conduct appropriate research by reading, talking with experts in the field, searching the Web. Use intuitive methods to winnow the list of potential sources, backers, scholars, experts, competitors, and locations. If the information provides clues to future developments that currently do not exist, it is important to find out what are typically called the current “state of the art” and “body of knowledge” in your particular field of inquiry or manufacturing or service. In the academy, graduate students working assiduously on a doctoral thesis resist the academic requirement to embed their unique contribution to the field in some historical and intellectual tradition. Each of us feels we are “reinventing the wheel” in whole or in part, forgetting that there is independent invention, or that so-called less developed individuals or societies may have thought a very long time ago about what we now think of as new. Businesses, on the other hand, cannot afford to waste time or money, so they spend a relatively great deal of time and money up front trying to limit what they are required to make “from scratch,” especially if they can use existing devices in new ways or at a fraction of the cost to produce all components. Talk with colleagues, remembering that there are only a few degrees of separation between you and any resource you might need to complete your prototype or to bring your product to market. Even if you do not know who these potential resources might be, you can use a combination of intuition and plain old database surfing to find out who might be of help or be able to point you to one who might be the critical resource you need. A business client had finally secured a patent for her product’s conceptual design and was ready to move ahead to develop the prototype. Through a series of well-framed questions during an intuitive session, she discovered that there were individuals in her immediate geographical vicinity who might be of assistance in this next important phase of her work. Several of these individuals she already knew or knew about, so that access to them would be quite simple and much less costly than traveling all over the country looking for experts. All she needed was right there in her own back yard! What we did with our fledgling company is develop what we called as our ”List of 100.” The list included people, companies, related products, and researchers on the subject of sound…everything we had been able to track down to date from our individual and collective research. In some cases, we didn’t know, and certainly in many cases I didn’t know who the names were, or why they were on our list. This created an opportunity to let intuition, or our business hunch, order the list and help us set immediate, near term, and long-term priorities. The results were nothing short of astounding: not only did the selection of the five as first tier contacts make perfect sense, but two of the five were actually the same individual, with the name spelled differently. That individual is one of the world’s foremost researchers in sound and a perfect source to introduce our work and find out if we truly were on to something important, or were simply “tuning in” intuitively to already existing concepts and products. As we went through the short list selected using intuitive means, I began to ask, “Who is that person?” “What is that company?” My other colleagues, Sue and Kip, had been going through old sessions, doing research on the web, finding bits and pieces of paper with names scribbled for future reference, and finally put together for my review the “List of 100.” What began with gasps of surprise as we read and discussed the 5 chosen as first tier turned into hoots and hollers as we realized the power of the intuitive process. We had selected people and companies that were at the very heart of research and product development in the area of sound. Our first tier list would help us validate our concepts, and permit us to move farther “outward” into the world of production. First things were first, arranged through intuitive selection. • Develop the inspired information using both intuition and reason, as well as your other normal tools for understanding and analysis, returning to your gut feelings systematically to flesh out the original concept. As remarkable as our initial work turned out to be, we were now required to put a solid foundation under our inspired notions. This stage of the process often feels more tedious, because it does not always provide “Aha!” experiences every hour on the hour. This is the phase of corroboration to determine the validity and reliability of those initial “hits.” It is important to contact selected individuals deemed to be experts in the field, and to read massive amounts of material to determine if someone has already published or manufactured in the area in question. We researched similar ideas, books, articles, and products. We contacted experts in the field who might be open to explore the concepts we were developing intuitively. We scoured the Internet, television, magazines, speeches, and news headlines for hints and clues to new technological developments that seemed related to what we were doing in our small corner of the world. We developed schematic representations from intuitive sessions and gradually turned those schematics into drawings that might make sense to a mainstream sound engineer. We hunted for discussions in mainstream science that might make our crazy ideas seem not so crazy at all. Each time we would add a technical or potentially technical component from intuitive sources, we were required to track down any corroborative information from rational or technical sources as well. The former came so quickly and easily compared to the interesting and exciting, but much more tedious tasks of grounding the work in the more acceptable worlds of science and technology. “When I am transcribing, I don’t think about the content. However, when I read the printed copy, I get a better understanding of the language the group is going for. Paying attention to that is what’s important to me. It is your translations that are the key to that flow. For example, when the working permits me to adapt this thinking to images, like a kaleidoscope of fractals, I put both kaleidoscope and fractal together in the Yahoo search box. That way of doing it links me to information more specific to what we’re looking for, rather than just typing in one or the other alone. If the research results trigger several examples, I take it as being important. I have found that paying attention to that single/simple thing, links the research to where I will get the most beneficial results. After that, I guess I would have to say that it’s almost an automatic takeover that happens. I am moved along to other information, which could be thought of as just a lucky find, but I know it’s all in the special attention from the get-go that moves me on to the rest, usually the best to be found. I also ask Kip after he has read the transcript what’s most important for him to know more about, because his verbalizing usually includes a word or phrase that I wouldn’t have thought of. For instance, he wanted to see a chart of elements. My pulling that up and just scanning it was a mini-lesson for me and opened up some new words (usually scientific language or just a code) that I’d jot down and add to the search. I am never actually reading the site information, just scanning; my eyes always seem to focus on the information that I feel will be important. This happens with a one page or five page finding. Sometimes I will click off from a site and immediately pull it backup, give it another quick scan. More times than not, I print the information and realize it was a keeper, a source of good information. Part of the site information will sometimes mention individuals or companies involved in whatever it’s about. I jot them down and pull them up separately, which has sometimes given more insight into the timing of their findings or future interests, and tell us they may be possible future collaborators. Something else that first surprised me was the timing of when I would find myself at the computer. I may have been moving the evening towards a bike ride or relaxing with a book. I may have even been in the middle of something else when that feeling/little voice made its move, and all of a sudden I was at the computer and wouldn’t rather be doing something else. Imagine Sue’s talent for using words to describe an image that is only perceptible initially in the mind of the intuitive, one who may have no professional experience in the field of inquiry, and no technical expertise to help translate the concept into meaningful terms for her! Then Sue (or a different colleague) works with the images and tracks down possible existing technologies or developments through Internet research, books, and articles. Many hours of taped sessions, each refining the image or the concept further, went into the development of a single schematic for a sound-based product. Eventually there was sufficient information to complete a drawing that all colleagues could view and refine together. During the first phase, however, we would talk by telephone and record separately from two distant states, each deriving our own meaning from the words spoken, which would eventually add to our shared schematic image. It is astounding to discover how much “independent invention” exists in the worlds of business and ideas. It is as if inventors, philosophers, and entrepreneurs are all watching the same conveyor belt of potentialities stream by their line of vision, ultimately selected or deselected for action on the basis of their particular desires, dreams, thoughts, beliefs, resources, and particular system of relevances about what is possible. • Return to framing intuitive questions based on the results of your searches and conversations concerning the next steps to take, individuals with whom to partner, anticipated strengths, weaknesses, opportunities, and threats to the success of the product. The process described above will go back and forth through many iterations among the team members as the concept or product takes form and becomes increasingly more sophisticated and real. Phone calls, email correspondence, web searches, articles and books traded back and forth, discussions with individuals who are not part of the team, but who suddenly “show up” with information that is relevant and exciting for the research and development team’s purposes. H – Yes, the second product is the propulsion product that uses sound to generate energy. There is battery oriented electrical energy, solar, and wind energy, but no one has yet  understood the power of sound energy as a propulsion device. The first is the palette (composition) product, to be used by composers and individuals who wish to create perfect sound around them. It also will be used with the much larger propulsion (second) product. 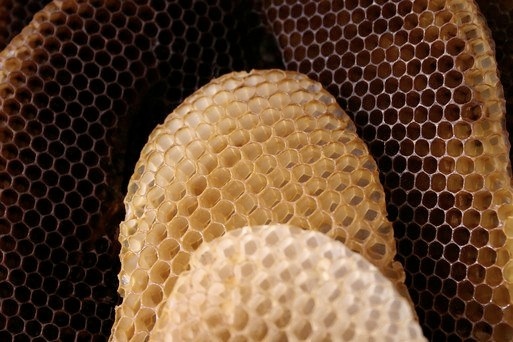 Both use the similar concept we’ve previously discussed regarding beehive technology. The palette device produces an infinite number of sounds which play upon the cells of human bodies, so that the ears, heart, mind, skin, bones and organs are all used in the production of sound. Some of these sounds are only heard in certain locations in the body, or through certain kinds of tissues or elements like the ear or eye structures. Bone marrow is a beehive concept within the core of the physical body. Bone marrow can make sound. The sound that creates the feeling of home is played at a cellular level through the existing structures of the body. Hair follicles hear, and the UUU palette is designed for total hearing. H: Let’s pick up thoughts from our last conversation that need to be cleared up now. What thoughts or images do you see relative to device # 1? What lingers in your mind and needs to be cleared up? K: I feel very clear so far. We left off with the beehive. Would it be “mossy cadmium” we’d be using in the beehive? H: It’s used for electroplating? Excellent. The concept is correct, but it feels as if there’s a patented next generation of this device or process. Find that. K: OK, more towards the electroplating, rather than [whether] it’s mossy? H: Well, it’s porous, but there is some electroplating that is made from metallic liquids that are not porous. With this kind, there is a process of etching that creates grooves into which information can be poured, if you want to use that analogy. There are receptors and holders, and in a sense micro caverns in which sound bounces off and out. So, it’s the combination of a product, superimposed on something that also, in its very nature, creates spaces, that forms this beehive concept. There will be a kind of electroplating upon the surface, so if you’re looking on the top you’ll see the openings. It is as if you paint the top surface of the beehive, but the chambers within are still there. Some of the interior walls will be painted by this blue cadmium element and some will not be painted. This variation will determine or affect sound quality. K: OK, I understand. Tell me more about the little dots that stick up. Sound exists in vacuums, and units of potentiality exist in vacuums before they are pushed into matter. Vacuums hold pre-matter in the form of potentiality, intention, consciousness and thought. Once thought or intention leaves the vacuum, it joins the ranks of measurable units of matter, whether neutrinos or quarks or something yet to be discovered. Vacuums do hold energy. But the energy is not material energy, it is incipient potentially materialized energy. It is potential matter, potential transformed energy that at some moment becomes visible weather or not [the energy is] measurable in the three-dimensional world, or five-dimensional world, or twenty-dimensional world. K – And that begins with intention? H – Intention is the substance of the vacuum. K – And that is followed by thought, words? H – Intention is consciousness, intention is thought. Sound takes intention and propels it outward into material reality. It is sound that is capable of alchemy, that moves thought, conscious awareness, potentiality, probability into expression in the explicate order. Thought arises from and results in specific configurations of energy that must be ordered in order to have meaning. This movement of energy to frame one thought instead of another has sound, whether framed in words or abstractions, and it is the motion and propulsion of sound that makes the material possible. Vacuums are teeming with sound. Scientists are misguided and must give up the obsession with measurement in order to discover true properties of sound. This will come with great difficulty because measurement is a cornerstone of the rational mind. Without motion nothing leaves the vacuum, and nothing enters or leaves the black hole, which is the container of material worlds. The vacuum is the container of non-material worlds. It is only precocious motion that is powerful enough to push a potentiality into material expression, and motion produces sound. Do you understand? All of the foregoing are examples of working in detail, through the intuitive process, to begin to flesh out concepts, products, and refinements regarding very specific ideas for the introduction of new products into the marketplace. The discussions are sometimes abstract, with no clear linkage to pragmatic outcomes, but rather offering perhaps some clue to further research in a field of inquiry. At other times they address materials, shape, color, and usage in quite specific terms. The range of intuitive guidance is quite broad; with practice, mastery, and fine tuning, the potential contributions to business and science are immeasurable.